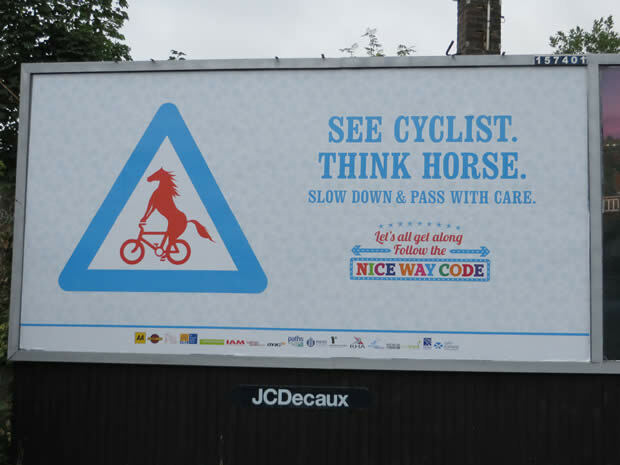 "Govt should introduce a horse/cyclist safety campaign funded by cycle tax raised through every bicycles having to have number plates. " I think cyclists may have the wrong idea about us. From this poster it looks like our horses ride bikes too! Perhaps we need a see-horse-think-? campaign! (? To be filled by some clever person in an ad agency). Cycle Scotland ran this campaign. And I believe it was very effective. And perhaps it could be funded by a cycle tax raised through every bicycle having to have number plates. I can't believe someone, somewhere in Government is not thinking about the possible revenue to be had.